UNCANNY X-MEN #266 CGC SS 9.8 5X Signed Double Sketch/Remarque 1ST GAMBIT. Signed by. Book is truly one of a kind. Joe Rubenstien and Jim Lee! OTHER NOTES: Brood appearance. SIGNATURE: Signed by writer Chris Claremont on 10/4/2008. GRADE: CGC 9.8 Near Mint/Mint, Signature Series. NOTABLE FLAWS: Book is graded and the signature certified by CGC, so you know what you're getting. SIGNATURE: Signed by writer Chris Claremont on 5/25/2013. OTHER NOTES: Magneto & Beyonder appearances, great Wolverine cover. GRADE: CGC 9.8 Near Mint/Mint, Signature Series. NOTABLE FLAWS: Book is graded and the signature certified by CGC, so you know what you're getting. Whilce Portacio & John Byrne Story! Whilce Portacio & Art Thibert Art & Cover! Signature Series Signed By Whilce Portacio! WHITE PAGES. BY LEGENDS STAN LEE, ANDY KUBERT, JOE RUBENSTIEN AND CHRIS CLAREMONT!! The more you buy the more you save. If your e-Check fails to clear on its first attempt, your order may be cancelled. If a service is not listed, it is not available. Signed by Andy Kubert on 6/16/07 at Wizard World Philadelphia. -Chris Claremont story, Andy Kubert cover. -1st full appearance of Gambit. The case is in excellent condition with no visible flaws. CGC is a professional grader. SIGNED BY LEGENDS CLAREMONT AND DAVIS! 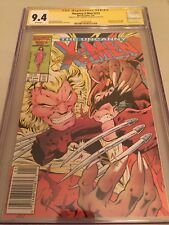 9.4 CGC, WHITE PAGES, WOLVERINE VS SABRETOOTH, PSYLOCKE JOINS THE X-MEN, AWESOME COVER. THIS BOOK WILL BE THE PERFECT ADDITION TO YOUR COLLECTION. Also note that I am limiting padded envelopes to 12 books vs 15. If books are thick, then a box may be necessary. (16 ) Books are wrapped in stated way but placed into padded envelopes for added protection in boxes. BY LEGENDS STAN LEE, JIM LEE, AND CHRIS CLAREMONT!! The more you buy the more you save. If a service is not listed, it is not available. We will be glad to assist you in working through the right channels to resolve the issue. BY LEGENDS STAN LEE, JIM LEE, ANDY KUBERT, JOE RUBENSTIEN AND CHRIS CLAREMONT!! The more you buy the more you save. If your e-Check fails to clear on its first attempt, your order may be cancelled. The Uncanny X-Men #281 (Oct 1991, Marvel) 8.5 VF+ PGX (like CGC) "signatures"
These comic grading services will grade a comic and then seal the comic in a hard-plastic case that displays the assigned grade. Publisher: Marvel Comics. A VF copy has minor defects but is in overall excellent condition. 4.5 out of 5 stars - The Uncanny X-Men #281 (Oct 1991, Marvel) 8.5 VF+ PGX (like CGC) "signatures"
2 product ratings2 product ratings - The Uncanny X-Men #281 (Oct 1991, Marvel) 8.5 VF+ PGX (like CGC) "signatures"
* Uncanny X-MEN #244 CGC 9.8 SS Silvestri 1st Jubilee! * Uncanny X-MEN #244 CGC 9.8 SS Silvestri 1st Jubilee! Shipped with USPS Priority Mail. These comic grading services will grade a comic and then seal the comic in a hard-plastic case that displays the assigned grade. It has also retained newsstand-fresh White Pages, adding to its desirability. Jim Lee & Whilce Portacio Story! Whilce Portacio & Art Thibert Art & Cover! Signature Series Signed By Whilce Portacio! WHITE PAGES. Great comic, white pages and well centered. Signed by Jim Lee, Chris Claremont, Tom Defalco and Stan Lee. Uncanny X-Men #217 (May 1987, Marvel) 9.6 NM PGX - WALT SIMONSON "signature"
1987, Dazzler vs. Juggernaut! signed by WALT SIMONSON. These comic grading services will grade a comic and then seal the comic in a hard-plastic case that displays the assigned grade. Adding to its desirability, it has also retained newsstand-fresh White Pages. The Uncanny X-Men #244 1st Jubilee CGC 9.6 NM+ Signed Stan Lee! Featuring the 1st appearance of Jubilation Lee aka Jubilee. Book is double signed by the legendary Stan Lee! 5 out of 5 stars - The Uncanny X-Men #244 1st Jubilee CGC 9.6 NM+ Signed Stan Lee! 14 product ratings14 product ratings - The Uncanny X-Men #244 1st Jubilee CGC 9.6 NM+ Signed Stan Lee! The Uncanny X-Men #221 Signed Chris Claremont CGC 9.4 NM 1st Mr. Sinister! Book is CGC graded 9.4 NM and signed by the legend Chris Claremont. 5 out of 5 stars - The Uncanny X-Men #221 Signed Chris Claremont CGC 9.4 NM 1st Mr. Sinister! 16 product ratings16 product ratings - The Uncanny X-Men #221 Signed Chris Claremont CGC 9.4 NM 1st Mr. Sinister! X-Men #266 1st Full Gambit CGC 9.6 4X Signed Stan Lee Jim Lee Kubert Claremont!! Andy Kubert - Star Artist. Stan Lee - The Marvel Comics Legend. 4.5 out of 5 stars - X-Men #266 1st Full Gambit CGC 9.6 4X Signed Stan Lee Jim Lee Kubert Claremont!! 30 product ratings30 product ratings - X-Men #266 1st Full Gambit CGC 9.6 4X Signed Stan Lee Jim Lee Kubert Claremont!! FIRST FULLAPPEARANCE OF GAMBIT. SIGNED BY THE LEGEND STAN LEE. CGC SIGNATURE SERIE S CGC UNIVERSAL GRADE 9.6. MARVEL COMICS, 8/90. CGC 4x SS 9.2 Uncanny X-men 266 Stan Lee Signed! CGC 4x SS 9.2 Uncanny X-men 266 Stan Lee Signed! Signed by Stan Lee, Claremont, Kubert and Rubinstein. X-MEN #214 (1987) CGC 9.8 SS SIGNED ADAMS! 1st APPEARANCE MALICE! DAZZLER MOVIE! "With Malice Towards All!". Story by Chris Claremont. Art by Barry Windsor-Smith. Signed by Arthur Adams on 3/28/2014. This issue continues one of the darkest chapters in mutant history. NOTE: Includes the Mutant Massacre Map, a key to following the events in this pivotal storyline. Signed by Chris Claremont. Story by Chris Claremont. X-MEN ANNUAL #9 CGC 9.6 SS SIGNED by ADAMS! APPEARANCE NEW MUTANTS LOKI! MOVIE! Script by Chris Claremont, pencils by Art Adams, inks by Alan Gordon, Mike Mignola, and Adams. New Mutants x-over continued from New Mutants Special Edition (1985) issue 1. Signed by Arthur Adams on 3/1/2018. X-MEN #196 CGC 9.8 SS SIGNED CLAREMONT! SECRET WARS II MAGNETO BEYONDER MOVIE! Secret Wars II tie-in. - "What was That?!". Story by Chris Claremont. Art by John Romita, Jr. and Dan Green. And, the one from beyond makes an appearance. Signed by Chris Claremont on 3/2/2018. X-MEN #209 (1986) CGC 9.6 SS SIGNED CLAREMONT! APPEARANCE of NIMROD & SPIRAL! Part 2 of 2. Story by Chris Claremont. Plus, Rachel is seduced by the dark magic of Spiral. Rachel's story continues in Excalibur (Vol. Signed by Chris Claremont on 3/2/2018. ). X-MEN #216 CGC 9.6 SS SIGNED CLAREMONT! APPEARANCE of WOLVERINE STONEWALL SABRE! "Crucible!". Part 2 of 2. Story by Chris Claremont. Art by Jackson Guice & Dan Green. Cover by Barry Windsor-Smith. Signed by Chris Claremont on 3/2/2018. Acts of Vengeance: Part 1 of 3. "The Key that Breaks the Locke!". Story by Chris Claremont. Art and cover by Jim Lee and Scott Williams. This inner circle consists of Doctor Doom, Magneto, the Kingpin, Wizard, Red Skull, the Mandarin, and a mysterious benefactor. Uncanny X-Men #269 CGC 9.0 SS Chris Claremont 1990 WOLVERINE Captain Marvel MS.
"Rogue Redux!". Story by Chris Claremont. Art by Jim Lee and Art Thibert. Cover by Jim Lee. Rogue battles the original Ms. Marvel for the right to be. And no matter which one of them wins.Magneto wins! "Folly's Gambit!". Part 1 of 2. Story by Chris Claremont. Art by Jackson Guise and Steve Leialoha. Cover by Walt Simonson & Bob Wiacek. Signed by Walt "I did the best version of Thor this side of Stan and Jack" Simonson. Signed by Chris Claremont. It's where hope goes to die. The lines are gigantic and the clerks are angry. Signed by Chris Claremont. Sorry, man. It's where hope goes to die. The lines are gigantic and the clerks are angry. "With Malice Towards All!". Story by Chris Claremont. Art by Barry Windsor-Smith. Signed by Chris Claremont. Is your CGC slab cracked?. Sorry, man. Sorry, no. It's where hope goes to die. Drawn by the co-founder of IMAGE COMICS and legendary Wolverine artist MARC SILVESTRI. Is your CGC slab cracked?. "All New, All-Different.Here We Go Again!". Part 1 of 2. Story by Chris Claremont. It's where hope goes to die. The lines are gigantic and the clerks are angry. Signed by Chris Claremont. It's where hope goes to die. The lines are gigantic and the clerks are angry. This is important for us to get you your books. As much as we dream of having the ability to read other peoples' minds, we won't be able to pull that off, so you've got to send us that info to get you your books. Signed by Dan Green. It's where hope goes to die. The lines are gigantic and the clerks are angry. Signed by Marc Silvestri and Dan Green. It's where hope goes to die. The lines are gigantic and the clerks are angry. "Harriers Hunt!". Part 1 of 3. Story by Chris Claremont. Art by Marc Silvestri and Dan Green. Cover by Jim Lee. Plus, from the pages of X-Factor - Jean Grey! NOTE: 1st appearance by Hardcase and the Harriers. Signed by Marc Silvestri. It's where hope goes to die. The lines are gigantic and the clerks are angry. ".Dressed for Dinner!". Guest-starring Magik. Story by Chris Claremont. Art and cover by Rick Leonardi and Dan Green. The events in this story take place after New Mutants #66. Illyana Rasputin, the New Mutant's Magik, fights for her life against the monster S'ym and the demonic hordes of Limbo. "Who's Human?!". Part 3 of 4. Story by Chris Claremont. Art and cover by Rick Leonardi and Terry Austin. Wolverine is gravely wounded, and without his mutant ability to heal he will die. Is your CGC slab cracked?.